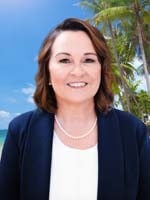 Christi is a Real Estate Advisor with Coastal Properties Group International and Christie’s International Real Estate. She was born in Tampa and has spent most of her life there. She currently lives in Carrollwood in the northern section of Tampa. She spends a lot of her off-time on Indian Shores. Christi enjoys either relaxing days on the beach or golfing on the championship courses at Carrollwood Country Club.